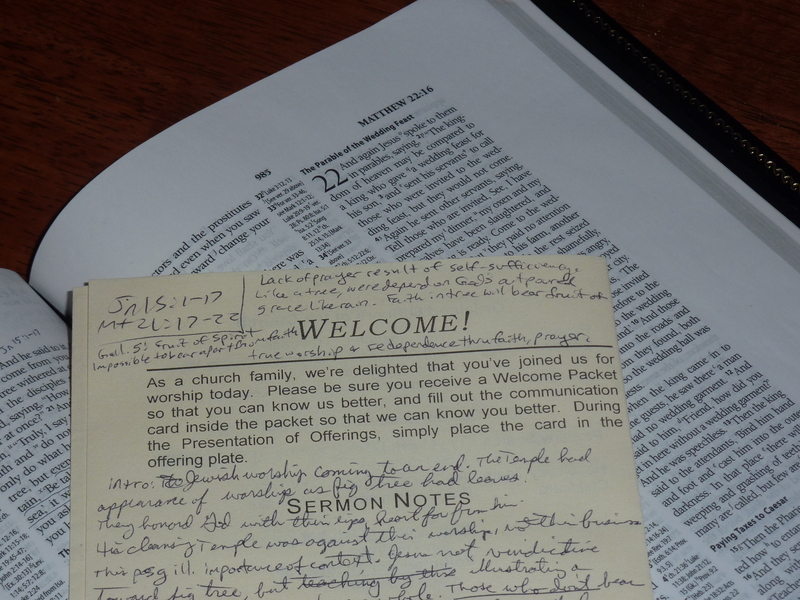 The following sermon notes summarize “The Fruit of Faith,” preached on Sunday, October 23, 2011 by Rev. Joe Troutman at Mid-Cities Presbyterian Chruch (OPC) in Bedford, Texas (listen online or subscribe to the podcast). My apologies for not posting last week’s sermon on the cleansing of the Temple, on which this sermon builds. I’ll try to post it at a later date. In the meantime, you can listen to that sermon, “The King Comes Home” (Matthew 21:12-17) at this link. Jewish worship was coming to an end. The Temple gave the appearance of worship as the leaves on the fig tree in today’s text give the appearance of fruitfulness. In their Temple worship, the Jews honored God with their lips, but their heart was far from him. Christ’s cleansing of the Temple in the previous passage was a judgment against their worship, not their commercialism. Matthew 21:17-22 illustrates the importance of context. In his cursing of the fig tree, Jesus was not being vindictive, but performing a prophetic act against the nation of Israel as a whole: Those who don’t bear fruit will be cursed like the fig tree, but those who believe will bear the good fruit of true worship and righteousness. In Search of Fruit (Matthew 21:17-19) And leaving them, he went out of the city to Bethany and lodged there. In the morning, as he was returning to the city, he became hungry. And seeing a fig tree by the wayside, he went to it and found nothing on it but only leaves. And he said to it, “May no fruit ever come from you again!” And the fig tree withered at once. The glory of God having departed the Temple, Christ returns to Bethany. Matthew and Mark use differing chronologies in their accounts of the cleansing of the Temple and the cursing of the fig tree. But both show the relationship between both events. One cannot be understood apart from the other. The fig tree was a symbol of the nation of Israel. “Woe is me! For I have become as when the summer fruit has been gathered, as when the grapes have been gleaned: there is no cluster to eat, no first-ripe fig that my soul desires (Micah 7:1). Jesus went to the tree in search of fruit, just as he went to the Temple in search of true worship. Neither provided what he sought. Professed faith is unfruitful for those who do not truly abide in Christ by faith (see John 15 above). As John the Baptist warned, the tree that does not bear fruit will be cut down and thrown into the fire. “’Bear fruit in keeping with repentance. And do not presume to say to yourselves, ‘We have Abraham as our father,’ for I tell you, God is able from these stones to raise up children for Abraham. Even now the axe is laid to the root of the trees. Every tree therefore that does not bear good fruit is cut down and thrown into the fire’” (Matthew 3:8-10). Thus Christ’s cursing of the fig tree as a prophetic warning was an act of mercy and a call to repentance. May believers never depart into false worship—we must trust the Lord to instruct us in the true worship of God, not our own wisdom. Christ’s reference to the moving of a mountain by faith seems to allude to Zechariah 4:6-9, in which Zerubbabel’s obstacles to rebuilding the Temple after Israel’s return from Babylonian captivity are compared to a mountain being made a plain. “Then he said to me, “This is the word of the LORD to Zerubbabel: Not by might, nor by power, but by my Spirit, says the LORD of hosts. Who are you, O great mountain? Before Zerubbabel you shall become a plain. And he shall bring forward the top stone amid shouts of ‘Grace, grace to it!’” Then the word of the LORD came to me, saying, “The hands of Zerubbabel have laid the foundation of this house; his hands shall also complete it. Then you will know that the LORD of hosts has sent me to you. The marveling of the disciples evidenced their lack of faith. Had they the faith of a mustard seed, they would have understood that nothing is impossible for God, be it the withering of a tree, the moving of a mountain or the production of the fruit of true worship and righteousness. True worship is impossible “in the flesh,” that is, apart from faith in Christ, but is possible “in Christ,” that is, through saving faith in him. The corporate worship of God is an amazing event: believers stand on holy ground in God’s presence. Unbelievers who presume to worship will prove unfruitful in the worship of God, and they will be judged by Christ as were the fig tree and the Temple.